NorthSide in Denmark recently held its fourth successful festival — this year bigger than ever before. With nearly 27,500 visitors each day, the three-day event, which has a high focus on sustainability, really achieves the ‘wow factor’. 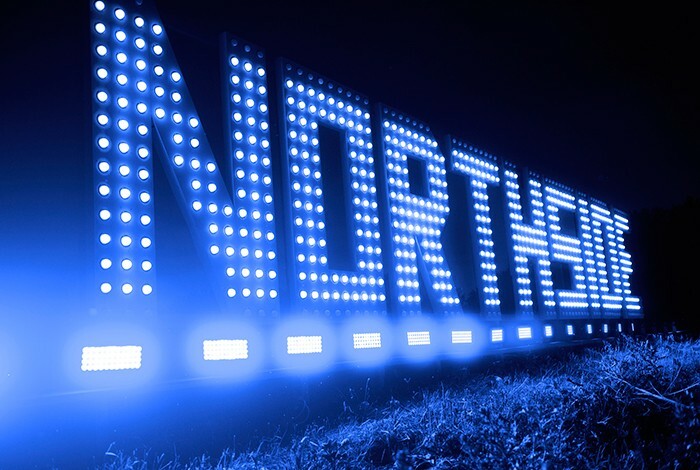 With an LED vision in mind, NorthSide’s production manager, Jesper Philbert, approached SGM to discuss his ideas. Says Philbert: “Being neighbours with SGM [in Aarhus], it was natural for us to present our initial ideas and outline sketches to SGM CEO, Peter Johansen.” Typically his reply was 100% affirmative. 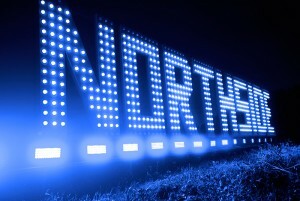 The cooperation caused much media coverage, as one of the concept ideas brought to reality consisted of an impressive 18-metre wide NorthSide sign (inspired by the famous Hollywood sign) designed for the main entrance, which was made from no fewer than 820 SGM LD-5 LED domes. Philbert comments: “We were looking for the ‘wow factor’ in terms of the scale of our sign” … while another objective was to create the right atmosphere, giving the audience the feeling that a major effort had been made in making the site look nice, cosy and stylish. Installation was also carried out in positive collaboration between NorthSide’s LD, Jacob Baekmand, Jesper Philbert, two product managers from SGM and a small team of six volunteers from the festival. According to Baekmand, the entire process — from idea to reality — was dynamic. “From the very first meeting, we were met with enthusiasm and professionalism from everyone involved, making this project proceed smoothly and resulting in a finished installation well ahead of schedule,” he adds. Besides the effect-rich LD-5 installation, SGM also supplied 45 bright P-5 wash lights and 140 SixPack halogen emulation blinders for entrance areas and tents. “Of the more than one thousand SGM products being put to use, not a single one buckled in the face of, at times, violent rain, the sizzling direct sunlight or the large volumes of dust we experienced on the site. There was not a single faulty unit, which I find extremely impressive,” Baekmand appraises. With an extensive résumé, this LD has worked with many leading industry fixtures over the years. However, SGM was still able to invigorate Baekmand, inspiring his creativity to team up for more projects. “I have been exceptionally pleased with the cooperation with SGM and hope this is just the beginning,” he says. “Already we are playing around with ideas for next year’s festival which will go way beyond what we have done this time.” And Jesper Philbert adds: “We are looking for ways to make big scale use of the SGM LED-tubes [LT-100/200] in a way that would grab everyone’s attention and amaze our audience. Watch this space!